Chrysanthemums are probably the most widely grown cut flowers. It is not difficult to have them in bloom from September through to January provided the appropriate varieties are chosen and a little heat is available. Following on the propagation period in the spring, the plants are best left outdoors during the summer months, and rehoused in September just before the autumn frosts begin, The cur-flower grower with a little heat available may find that roses and carnations, grown either in pots or directly in the border soil, will happily complement chrysanthemums in his growing programme. The main salad crops - lettuce, tomatoes, cucumbers, peppers, radishes, and spring onions are grown in the greenhouse borders, and no benching is necessary. Tomatoes are one of the main summer crops and as such occupy the greenhouse from April or May through to September and even October. While the tomato plants are stilt small it is possible to grow a quick-maturing crop ot early radishes between them. Although lettuces are often the crop to occupy the borders from October to April, their cultivation is not easy; but they mature at a time of high prices so they are well worth while. They can be cleared in time to allow you to prepare your borders for planting tomatoes. It is possible to get two crops of lettuce in winter in the south of England if soil-warming cables arc used. To make the best use ot the greenhouse, erect temporary shelving in the spring to provide propagating space for a wide range of Other crops. Salad crops grow particularly well in polythene-covered greenhouses, and today many gardeners buy this type solely for salad-crop production. 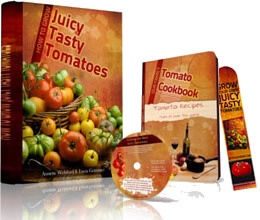 They are especially useful if you wish to grow tomatoes and cucumbers. 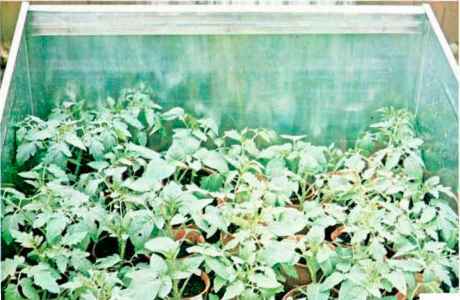 Under glass tomato plants and cucumber plants do not grow happily together because they require quite different humidity levels; in polythene-covered greenhouses, however, they usually grow satisfactorily side by side. 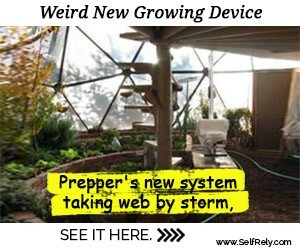 Plants raised 10 I he greenhouse (or subsequent planting outdoors need to be hardeneet-off in a garden frame The amount of ventilation given is increased gradually uniit finally the top of the frame is left off. The development of the inexpensive polythene-iCovcred greenhouse has caused a revival in the popularity ot vegetable growing in the small garden area available in most modern homes. Provided suitable varieties are chosen, a wide range of vegetables can be grown without extra heating, and this intensive method allows more than one crop to be grown on the same ground. Filling the greenhouse borders with vegetables is no problem m the spring, summer, and autumn. In the winter months the choice is more limited; a crop of overwintering lettuces is one possibility, and rhubarb may be forced into growth if it is brought undercover in early January. If soil-warming cables are installed in part of the greenhouse border soil, even quicker growth can be achieved. Polythene-covered structures are not usually designed to take shelving, and the manufacturer or retailer should be consulted if you want to instill it. If their use is confined to the spring months, shelves should not be detrimental to the crops beneath.